About 1 000 women in Matabeleland South have been trained in poultry production amid high expectations that the programme spearheaded by the First Lady Dr Grace Mugabe will uplift the living standards of the beneficiaries. In a bid to empower women across the country, the Zanu PF Women's League secretary, the First Lady rolled out a poultry project that has seen women being equipped with skills on the project before implementing it. After training women in Beitbridge, Irvine's Zimbabwe technical advisor and training facilitator Mrs Sisa Mpofu expressed optimism the programme will produce the desired results. Zanu PF provincial Women's League secretary for production Gladys Tlou expressed gratitude to Dr Mugabe for the chicken project highlighting it will alleviate hunger and poverty within families and communities in line with ZIM ASSET. 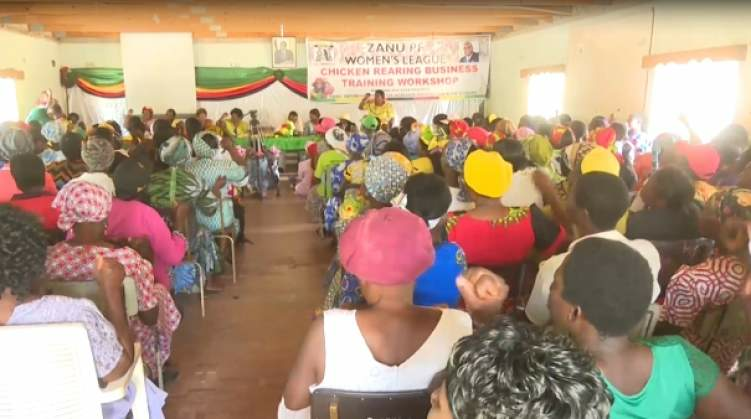 The training workshop was also graced by the Zanu PF provincial chairman, Rabelani Choene who took the opportunity to remind members of the Women's League as well as youths to register to vote so that they continue to benefit from the revolutionary party's people centred policies and programmes. Each province will receive 3 000 chicks.